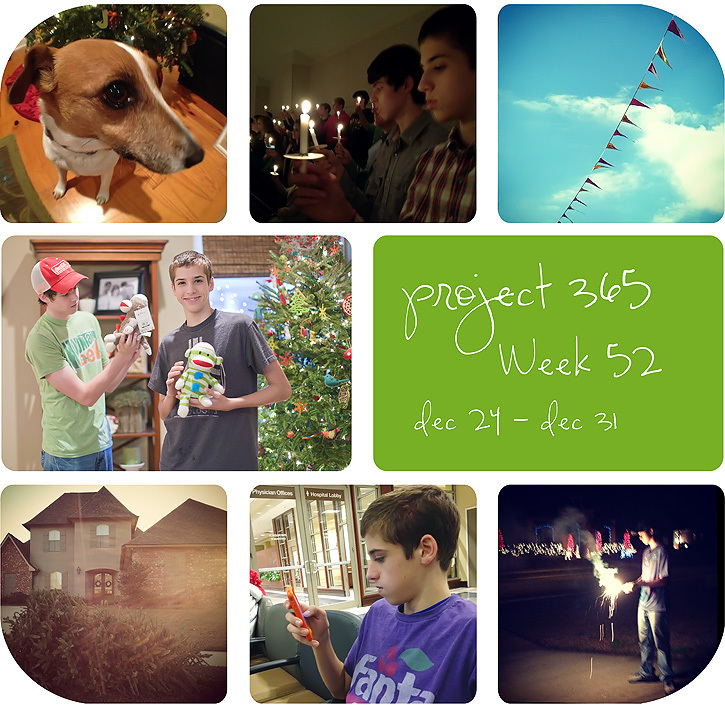 I skipped last week's collage so I'm going to finish out the year with week 51 and 52 of my 365 project. I will still be taking a pic a day (or at least seven pics a week) in 2012, but I haven't decided how I will post them yet. I don't think I'll continue to make the collage each week, but I will be sharing my project life layouts as I get them completed. The template I used for my 2011 project 365 collages is available at The CoffeShop Blog here. I saw the ER trip on instagram! That was one sharp elbow! Also, you have an ipad, right? When you use blogger (and load a draft) does it come out in HTML code? Or am I doing something wrong? Congrats on making it all 52 weeks! Great shots once again. I love the one of the cousins - they look like they are having fun with each other. That must have been some elbow - ouch. Lovely collages...I have so enjoyed following your year. Your photos are an inspiration. Happy New Year! These send a wonderful holiday message - family, good times, happiness. Beautiful! and Happy New Year! Congrats on finishing your 365! All such lovely photos!!! I have missed you. I'm glad to hear that you'll still be around sharing more inspiration in 2012. What a wonderful finish to your project! It was absolutely awesome and I always loved to come here in see your collages! Of course, I'll continue to come here in 2012 even without collages ;-) Have a wonderful 2012! Looks like a great way to end the year! Love the cute shot of your Maisy a fisheye is on my list of wishes. :-) Love that this one was for your phone! Finishing a 365 project takes real dedication. Your collages are always so beautiful! Its been a real pleasure to follow your blog. Both great collages! 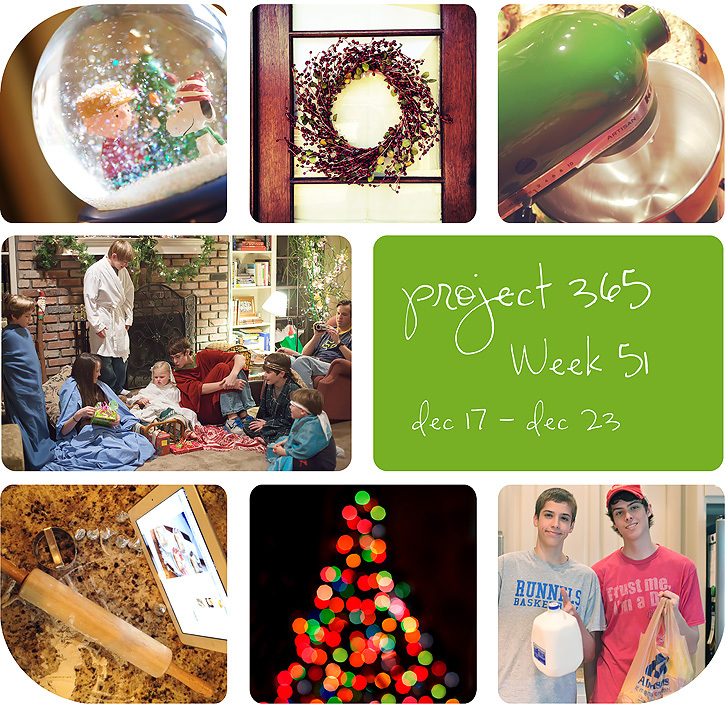 I've so enjoyed this P365 journey with you in 2011. So glad you had a wonderful Christmas! Looking forward to seeing your Project Life pages! And I can't wait to get my kit ... should be here soon! I think your collages are brilliant and your photos always so lovely and interesting. Looks like such a wonderful two weeks. Thanks so much for linking up with us. I love your mixer color. The singing sock monkeys were quite the hit at my Christmas as well! What an awesome week. I love the photos. Aww, I love the acting out of the Christmas story, so sweet! LOL, I just got the red Kitchen Aid mixer for christmas and I love it! Made a batch of chocolate chip cookies the other night & it was so quick! The best one's I've made! I am digging that colorful bokeh pic.